Preheat grill to a low heat. In a saucepan over low heat, warm up the beans with a teaspoon of salt and pepper. Place large slices of mango and watermelon on the grill, it makes it chop them up into smaller pieces later. Cook for 2 minutes on each side or until the color changes. In a bowl mix the dressing ingredients: olive oil, teriyaki sauce, sweet red pepper, lemon juice, honey mustard, chipotle sauce, garlic powder, salt, pepper and parsley. Mix well. Once the beans reach a boiling temperature, let them cool. Then drain them and pour into a glass container. Take the mango and watermelon from the grill and cut them up into pieces. Add the pieces to the bowl with the beans. Peel the avocado and cut into tiny slices. Add it to the beans and fruit. Serve it on top of romaine lettuce leaves and garnish it with a little branch of parsley. 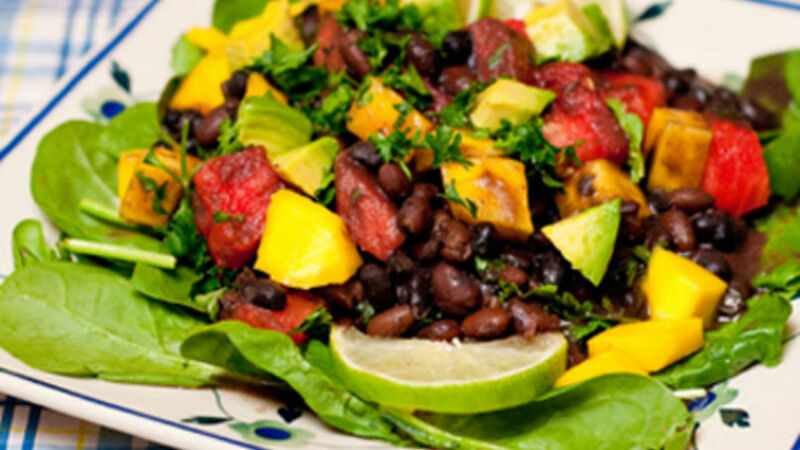 This salad with black beans is one of my most popular salads. Everyone loves it and ask for it when I host visitors and friends at home! No one passes on this salad because its tasty combination of ingredients and a favorite dressing make it the perfect mix.